What do you think was the greatest scientific feat of the twentieth century? There are certainly a lot of heavy contenders. Perhaps it was the discovery of antibiotics. Or maybe Einstein's theory of relativity. Quantum mechanics is pretty awesome, providing the physical basis for around a quarter of the world's gross domestic product. And hey, let's not forget about the revolutions in chemistry and synthetics. Semiconductors? Lasers? Realizing that birds are dinosaurs? Pinning down the age of the Earth? Like I said, plenty of formidable contenders, and we could probably spend a few evenings (with plenty of libations) debating the various merits and finer points. But let me humbly suggest something a little surprising: a website. Yeah, a website. At first glance it's not much to look at. It doesn't have fancy widgets or popups. There are no embedded videos and no comment sections. The website was made in the 1990's and looks like it. If you start clicking around you'll find...science. A lot of it. An almost overwhelming amount. Jargon and diagrams and abstracts and math and references. Science. The arXiv is a library of "preprints", or articles that are not quite ready for publication in a journal. You see, once a scientist has submitted an article for publication, and successfully combatted peer review, the journal then cleans it up to their standards and format. That final version is copyrighted by the journal itself, but the journal has no claim on the words and math and, you know, ideas in the article. That liberates the scientist to submit the same words, math, and ideas, in a different format, to anyone they want. Including the whole entire world. Thus: the arXiv, a place where scientists from around the world can submit their science for other scientists from around the world to read. It's not popular in every field, unfortunately, but the number of disciplines using the arXiv continues to grow. And it's free and open for all: if you've clicked the link, you probably didn't realize just how much science you were able to access, going back decades, without hitting a single paywall. The arXiv is an enormous resource for scientists and researchers in every country and with every background. It's the default place to begin digging up references for many people, and it's the first place many people upload their papers to right after submitting to the journal. In fact, many scientists submit their paper to the arXiv before it even passes peer review. While this might seem a little perverse, they view it as an obligation to better serve free, open science. After all, what's better than a small handful of anonymous referees deciding if your paper is worthy of publication? Why, none other than your entire peer community practically salivating at the chance to sink their teeth into your shiny new (and vulnerable) paper. 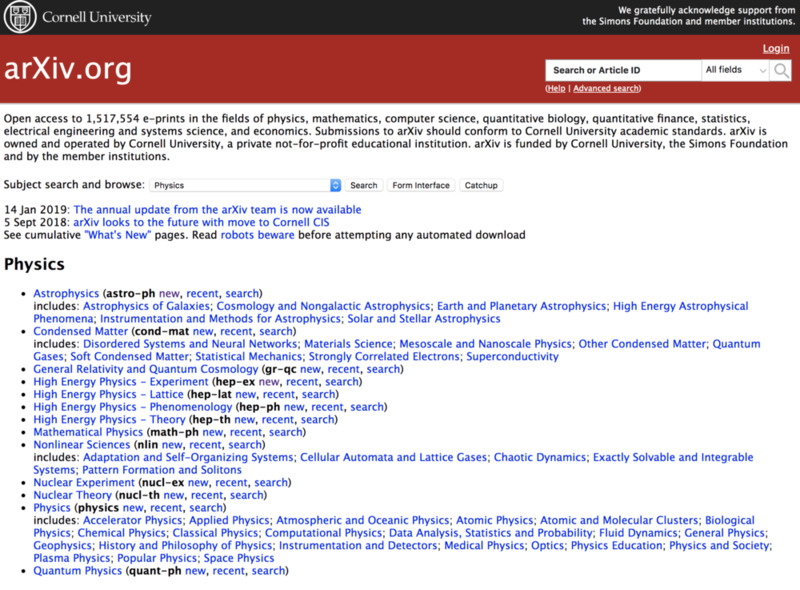 The arXiv has tremendously democratized and accelerated science. There's no need to wait for the next journal issue - research is revealed as soon as it's ready. While it's hard to quantify the significance of something like a digital scientific Library of Alexandria, it's impossible to ignore its impact.